Do professionals always say "permafrost" or are there any synonyms? The most popular term now is cryolithozone, although the two words are not completely synonymous. Permafrost is ground (soil or rock) that includes ice, while cryolithozone also includes various fluids or subterranean water of high concentration at subzero temperatures — Celsius, of course. So, cryolithozone is a broader term, although they are interchangeable is similar contexts. Which part of soil can be defined as permafrost? Vladimir Dubrovin: Permafrost is soil that has been frozen for at least one year. For example, the frost line, or freezing depth, in Moscow is 1.54 meters, which should be taken into account in construction, but this frozen soil thaws out every spring. If the frost line is 3 meters and the thaw line is 1.5 meters, the remaining part of frozen soil would be defined as "pereletok" or perennial frozen grounds and rocks. The depth of cryolithozone in Russia varies between several meters and 1.5 kilometers in the upper reaches of the Yana River, where the so-called Pole of Cold is located. The maximum depth of ice-containing permafrost is 600 meters. The average depth is between 250 and 350 meters. How much area is permafrost in Russia? Permafrost occupies 68% of Russia's territory or 11 million square kilometers. This is larger than the territory of the United States, China, or Canada. It is a huge geological body with temperature and ice acting as the connecting elements. Permafrost occupies 85% of Russia's Arctic zone, with the exception of the Murmansk and Arkhangelsk regions. 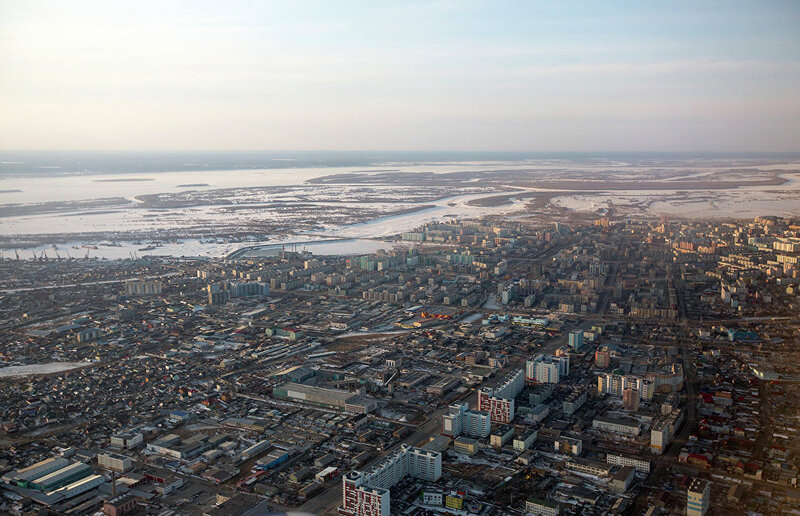 Permafrost in the Vorkuta area can be described as discontinuous permafrost in terms of area and depth, while the territory east of the Urals is referred to as continuous permafrost, when only the upper layer of soil thaws in summer. This is described as seasonal thaw. In the non-frozen zone, for example, in Moscow, we have seasonal freezing, when the upper layer of soil freezes through in winter and thaws in summer. What is happening to permafrost? Frankly, it is impossible to understand what will happen to permafrost in future without analyzing the ongoing climate change, changes in air temperature, precipitation and the like. The process of warming in high latitudes began in the 1960s, and it has not stopped yet. But the speed of change differs from one Arctic region to another. Climate researchers and geocryologists are analyzing the data reported by 85 weather stations in the Arctic zone. So far, the data point to the continued warming, but we cannot rule out that the temperature curve will fall off in the next five or seven years. All climate changes are harmonious, with a rise followed by a fall. The temperature in frozen soil is changing now because of the global warming. Our equipment installed in the offshore wells in the Kara Sea and in the onshore well near the Marre-Sale geocryological station in the western part of the Yamal Peninsula is closely monitoring temperature curves. We use these data to calculate the average annual temperature at a depth of between 80 and 100 meters. For example, the average annual temperature of frozen soil has increased since 2009 by more than 1.5 degrees Celsius at a depth of 10 meters, by nearly 1 degree at a depth of 20 meters and by 0.2 degrees at a depth of 50 meters. This is shocking information. The changing heat flow in permafrost in the Arctic is the most objective evidence of global warming. But the reasons for it include not only rising air temperature but also the amount of precipitation (snow) in winter. We need to analyze all factors. Wind influence on snow depth distribution is especially important. Some researchers believe that climate warming in the Arctic is cyclic. Yes, we can see these cycles both in the structure of the permafrost and in the cross-section distribution of the ice cover. So it's possible that man's role is not as significant as we think? We call this factor technogenesis. Almost 90 percent of mineral resources (several kinds) are located in the Arctic. It is a treasure-trove we should use. However, any technique to extract mineral resources will lead to changes on the surface and in the ground. Most often, this means an increase in the temperature of frozen rocks and the depth of the seasonal thawing of the soil. It means that, based on construction techniques, the extraction company will strip the top soil with its plants, moss and grass and remove soil for the foundation of the buildings they need, that's why solar heat affects the soil more and runoff conditions change. This is the most common example of how construction can affect the soil. When we use buildings, heat also sinks into the permafrost. On the average, every construction results in a 1-1.5 degree increase in temperature in this area. We have checked this at Medvezhye, Urengoiskoye, Yamburgskoye and other production fields. The scarred topsoil layer will only be restored under special conditions, and this requires at least 80 years. As a rule, the composition changes. For example, cotton grass, daisies, sedge and other plants begin to grow instead of moss and lichens. This is the first sign that something is wrong with the land; that someone has been digging there. Do you suggest no extracting? No, we have to do some extraction. I don't like the term "sustainable development," because we can be "sustainably" sinking. I prefer the word "balanced." We should only damage nature to the extent that it can restore and sustain itself; it cannot be allowed to get to a critical point. To do this, we should study the permafrost and carry out geocryological monitoring. It is important to do more than simply monitor, because right now the research institutions and many extracting companies do that; it is important to make timely decisions based on science. Ideally, a deputy prime minister with the proper authority should be responsible for this. How does the state monitor this now? Is science going through hard times? Hard is hardly the right word. In the past we had a ministry of geology whose main task was to study what was in the earth, and which had the funding for this. Now the Federal Agency for Management of Mineral Resources (Rosnedra) of the Ministry of Natural Resources and Environment does this, but in fact, if we look at how the work is funded, their main goal is to give the production fields to subsoil users. The current hydrogeological and geotechnical photography mapping of the Russian Arctic zone, in 1:200,000 scale, shows that this work has not been done in the Arctic. Meanwhile, this is the fundamental document for the non-frozen zone, on which all decisions regarding construction, water supply, runoff and so on are made. This is a very costly map; it includes the European part of the Russian Federation and the accessible regions where you can drive without harming nature during field work. Now it is impossible to carry out such work in the Arctic, because it is very expensive and the drilling companies don't need such a scale. We need different approaches and a different scale of research and monitoring of the permafrost due to the intensive exploration in the Arctic. So, if the ministry of geology was responsible for this earlier, now almost all the potential production fields (over 600 fields) in the north, including the underwater Arctic shelves, have been given to subsoil users, which means that the state does not have to monitor them. However, these areas are not yet completely researched. The government has authorized subsoil users to study those areas. Have they failed to do so? Yes, they have. The objective to further study these areas was partly written into the license agreements, but the companies have failed to do so. Last year, in September, the government suspended the issuing of licenses but by that time over 600 licenses had already been issued. Now the immediate task is to develop standards for the license agreements approved by the Ministry of Justice that will require companies to monitor the permafrost in compliance with established guidelines, and supply data to the Federal Ministry for Natural Resources. We at Hydrospetzgeologiya working to develop this type of document and it may take us 12 to 18 months to finish it. Regarding funding, in 2017, the Federal Ministry for Natural Resources allocated 800 million rubles for hydrogeology, geological engineering and the state monitoring of mineral resources, of which only 26 billion rubles will go on prospect and evaluation survey. The proportion at Rosgeologia Company is even more impressive: 100 million rubles against 33 billion rubles. These figures are allocated for the entire country, while not more than 20 million rubles is spent annually on studies in the Arctic. Both figures — 800 million rubles and 20 million rubles — are unacceptably small amounts of money. To study and forecast changes in permafrost conditions, we need a state program, Russia's Cryolithozone, that will be carried out by the Ministry of Natural Resources and Environment and the Federal Agency for Construction, Housing and Utilities (Gosstroy). The ministry will track background changes while the federal agency will monitor cities and facilities built on permafrost. All information must be forwarded to the single data base. There was no such program in Soviet times either; however, this sector received more funding. Do you think the appearance of craters on Yamal is associated with permafrost? Of course, I do, and these extremely dangerous processes are primarily linked to the hydrogeology of subpermafrost layers. Opinions differ but so far no serious research has been done. The answer to this question could be found if the required amount of mining and drilling work and geophysical research is carried out. For now, I won't engage in speculation.